Family medicine introduced many great things to medical education. We had non-physician faculty in our departments and residencies, psychologists and educators, unheard of then. We valued education, and realized that just being a good doctor was not the same as being a good teacher, so created faculty development programs, including fellowships, often supported by Title VII grants. Our Board required recertification from the beginning, and no one, not even those who created it, were immune, or “grandfathered in”. Many of these innovations (if not the “no grandfathering”) were adopted later by other specialties, although not always crediting the discipline family medicine. And many specialties have not adopted them yet, still to their shame. But, in the US, family medicine is still somewhat on the margins. It never completely took over as the centerpiece of the health system, not as in Canada or the UK. Much of the opposition has been regional, especially in the NE, and in cities where there were already plenty of doctors who did not want to give up control – or money (remember that word, money, we’ll be coming back to it). Of course, then, as now, most pundits who comment on medicine – actually, on all things – are, at least relatively, well to do. Poor people often adopt such attitudes as “specialists are better”, because they assume that what the rich have is better (bigger houses, better cars, certainly better doctors), although those of us who went to medical school know that that is not necessarily true. Our classmates who wanted to become elite subspecialists caring for the rich did that, and those who wanted to serve the needy did that, and it had little or nothing to do with class rank or skill. Of course, the obstacle to poor people getting what the rich get is, well, they don’t have, and so their doctors wouldn’t make, enough money!! may be mostly gone, but that model was long the darling of the RRC; those of us working in inner-city training settings often felt that the rules were written for someone else. Other issues confront us, sometimes divide us. Should the future of family medicine be about “full scope” practice, including caring for children, delivering babies, hospital work, emergency care, musculoskeletal care? Or should it be limited, specialized even (OB, geriatrics, sports medicine)? Should we be using the term primary care or family medicine? What about general internal medicine? Pediatrics? GIM has pretty much abandoned the field, since 80% of IM graduates become subspecialists and over half the remainder become hospitalists. Should we just stop saying “primary care” and insist on “family medicine”? Most of us recoil at the oft-heard-from-medical-students idea that GIM is family medicine without the OB and pediatrics. We think that there is a conceptual basis for our specialty that has to do with caring for the whole person and caring for them in the context of their lives, families and communities. Despite the concerns of the young Josh Freeman, this context is critical. The pediatrician cares about the health of the child she cares for, and likely that of the adult that child will become. The family physician also cares for both, but more concretely than the pediatrician experiences the health issues that adults face that often have at least part of their roots in their childhood experiences. In addition, the family doctor cares for that child’s family, and knows, for example, that the child’s mother is not just “mom” (I hate that usage!) but someone with their own problems, maybe a hard job, maybe not enough money, maybe a troubled relationship, maybe caring for her own parents, maybe with her own health issues. I have often said that if clinical sciences have associated basic sciences (like psychology for psychiatry, and anatomy for surgery) then anthropology is the basic science for family medicine because it examines people in the context of their families and communities. Sometimes the issue of how family physicians practice is formulated as a conflict between lifestyle and scope. Is that true? Maybe. Maybe it is good to not take call, or too much call, or have to round in the hospital or have to get up to deliver a baby in the middle of the night. But it may also be true that for a well-trained family doctor, 8-5 clinic patients can become drudgery. Sometimes teaching helps. And what about the issue of lifestyle vs lifestyle? People want to move to and practice in cool places to live, with a lot going on, stimulating cultural events and good educational systems. But these places may pay less money and cost more to live in. Besides your practice, do you want to be San Francisco poor or Nebraska well-to-do? That old white picket fence family doc may have had no conflict, but now young people do. There have been lots of changes in the health system in my lifetime. Family medicine was created in the 1960s and grew to adolescence in the 1970s. In the 1980s we had lots of promise; Nixon pushed for HMOs, and in the 1990s we had gatekeepers – and different opinions about whether that was good or bad. Our best resident matches were in the late 1990s; no student wanted to be an anesthesiologist because they were afraid of not getting a job. But now …. One study showed a student entering an anesthesiology residency can expect to make $7 million more in their lifetime than one entering family medicine. In this country. When I was in Denmark a few years ago I visited a rural family practice. In conversation, the doctor mentioned his daughter was married to an anesthesiologist. Tied to my own country’s norms I joked that at least he wouldn’t have to worry about being supported in his retirement. Oh, he replied, in Denmark family doctors make more than anesthesiologists! We have a health system that fails to focus on the health of the people. We have almost abandoned the concept of public health. Indeed, the currency of the term “population health” is more than a semantic difference. Population health can be narrowly defined to be any population – the population of your practice, say -- and it can and does often leave people out. The people who are hard to care for, or don’t make money for us, or mess up our statistics. Public health requires us to look at the WHOLE public. Eew! How messy! Mullan, Fitzhugh. Big Doctoring in America: Profiles in Primary Care. Millbank. 2002. The history of family medicine is familiar to those of us attending this conference. Although most of us were not there “at the beginning” in the 1960s, we have heard, frequently at this conference, about the seminal reports, people, and events that led to the founding of our discipline. The Willard Report, issued in 1966, was commissioned in 1964 by the American Medical Association’s Council on Medical Education and found that medicine needed a new kind of specialist, the family physician, educated to provide comprehensive personal health care within the nation’s complex healthcare system. It defined a family physician as one who “accepts responsibility for the patient’s total health care within the context of his or her environment, including the community.” The COME also commissioned a report on graduate medical education to achieve this goal, and the Millis Report was also issued in 1966. It contained one of the earlier modern definitions of a primary physician, one who “...will serve as the primary medical resource and counselor to an individual or a family”. The 1967 Folsom Report, developed by the private National Commission on Community Health Services and sponsored by the American Public Health Association and the National Health Council, called for “communities of solution”. Following these reports, the AMA hired two early leaders in our field, Drs. Leland Blanchard and Lynn Carmichael to “develop family practice”, and they crossed the country doing just that; Carmichael established the first FP residency at the University of Miami in 1965. By 1969 there were 16 residencies. These early residencies were led by major figures in the history of the discipline, including Gayle Stephens in Wichita and Gene Farley at the University of Rochester, and grew to nearly 500 by 2016. The choice of the term “family doctor” to replace “general practitioner” was not incidental. The ABFM was founded in 1969, but the AAGP did not change its name to the AAFP until 1971, after at least 3 failed efforts. Obviously, people had always referred to their primary physician as their “family doctor” and for marketing purposes the term “family doctor” evoked positive feelings among the American people. Like everyone here, I am sure, I can tie this to my personal story. Entering medical school in 1973, I did not come from a medical family, and think my parents had only one physician among their friends. I knew what kind of doctor I wanted to be, but not the right word for it. I didn’t even register GP; I wanted to be a “regular doctor”. You know, the kind you can go to with whatever is wrong and not have to diagnosis yourself first, and they can take care of it. As far as specialties were concerned, I guess I had an idea that pediatricians took care of children and obstetricians delivered babies. And maybe from high school friends who had money as well as acne, I knew that dermatologists took care of skin, but that was probably it. Of internal medicine, which played such a huge part in medical school, I had no concept; if anything I would have probably guessed it had something to do with gynecology, as I remember my mother having gone for annual “internal” exams. My medical school, Loyola, had no family medicine at that time, but as I approached my scheduling for clerkships I found out that there was a physician, Werner Cryns, who ran a family practice clinic at the school. Trained as a pediatrician, Dr. Cryns had gotten private outside funds to establish this small clinic in a corner of the medical school, and I chose it for my elective. It was also my first clerkship, and from then on, I knew that was what I wanted to do. I did my residency at Cook County Hospital in Chicago, under Dr. Jorge Prieto, only the fourth full class to start in 1976. (Little side story: the hospital had always given out an “intern of the year” award, and in the first full class of FP residents, in 1973, it was won by one of them. Everyone else freaked out because “they rotate with everyone; they’ll always win it”, so there went the hospital-wide award. It became departmental.) I wanted very much to work at this public hospital with all of my socially and politically conscious friends from many of the Chicago medical schools, and was thrilled that they had a program in family medicine. I had interviewed around the country, though, and found out about different programs, including two others that consciously saw themselves as training doctors for the urban inner city populations, Montefiore and San Francisco General. If I had gone to Montefiore, back in New York where I had lived my entire life before medical school, I likely would have had me a different life, but that cannot be known. I wanted to love SF General, as I loved San Francisco and had been unsuccessfully trying to get to California at least since applying to college, but was actually turned off by its emphasis on family dynamics and behavioral science. As someone who loved his own family but saw very much the negative impact that many families had on their children, I wanted to “keep the family out of family medicine”! Suffice it to say, I was wrong, and long since have understood the importance of the interaction of people, families, and communities, on an individual’s health. At the 1989 Denver STFM meeting, I heard Gayle Stephens talk about “Family medicine as counterculture” (the talk was later published in Family Medicine), and I admit that I was pretty surprised. I felt I had been part of the counterculture, but that doctors, even family doctors, even Dr. Stephens, were a bunch of old white guys in suits representing the establishment. I have to admit that, even though I have long since become an old white guy, and have been frequently known to wear a suit, the faces of those stern corporate-type authority figures from the 1950s and 1960s still make me anxious and a little bit hostile. (Full family disclosure, my father was a worker, not a suit.) But 1989 was a seminal STFM meeting. I had already been attending STFM for some years, first in 1982 as a fellow at the University of Arizona, and then starting in 1985, when Dr. Prieto shared the educator award, every year since. If I make it to Toronto that will be 35 in a row. Actually, maybe it was 1988, in Baltimore, that was the seminal year, because that was the year Sen. Orrin Hatch received the Leland Blanchard award from the Foundation, orchestrated by Utah department chair and STFM matriarch F. Marian Bishop. I am sure Dr. Bishop did not anticipate, and surely did not appreciate, the antipathy of much of the younger cohort of STFM members to Sen. Hatch. From her point of the senator had been a big supporter of Title VII and family medicine. From our perspective, he was a virulent opponent of not only abortion rights, but ERA and other key issues affecting women. The only organized group within STFM opposing this was the Group on Women, which gathered signatures on a petition that was presented at the business meeting. So, the next year, 1989, in Denver, there was a conscious effort to make a change. David Schmidt welcomed us with an upbeat and progressive speech. The Blanchard lecturer was Christine Cassel, then a professor of geriatrics at the University of Chicago and later a lot of other things, including head of the ACP Foundation and seminal in developing the “Choosing Wisely” program, speaking on medical ethics. In addition to Dr. Stephens’ talk on counterculture, Dr. Roger Rosenthal spoke about the need to care for underserved people. Several new groups were organized that year, including the Group on Minority Health, which still exists, and the Group on Universal Health Care, which had a shorter life. I felt really good about STFM and Family Medicine – and still do. I met lots of people through family medicine – at STFM and the Program Directors’ meeting (later AFMRD), and this meeting, who were inspirational, like Frank Dornfest, the South African who was at the time program director in Santa Rosa -- the program our own Rick Flinders has written a history of -- and Gene Farley, who I met when I was a fellow at Arizona and he was chair at Colorado – an inspiration for his whole life. And some who were not old white men – Jorge Prieto, Denise Rodgers, and Carlos Moreno, and Janet Townsend, and others like David Swee and John Frey, white men who were not yet old! And the folks I worked with at Cook County – Pat Dowling, Janice Benson, and Crystal Cash, and many others. And, of course, many of those I have met or gotten to know better at this conference. Medicare for All: Still a great idea! My last several posts have all had “Medicare for All” in the title. This makes one more. Maybe I am in a rut, or maybe it is simply the most important issue confronting health care in the US. Certainly there has been a lot written about it; just a review of very recent articles in the New York Times includes a wide variety. Conservative columnist David Brooks informs us that there is “no plausible route” to get to it, and we are told by Reed Abelson and Margot Sanger-Katz that there is “no precedent” for abolishing private insurance. The angst of the Democratic Party leadership in dealing with this newly-resurgent demand from its base is also discussed at length, with the Associated Press letting us know that it is a “divisive issue for Dems”. Robert Pear tells us about Nancy Pelosi’s plan to “expand health coverage” while being sure to not cover everyone. Of course, President Trump, not to be outdone (nobody outdoes the #Trumpenik!) has now announced his own plan, to completely gut and get rid of the Affordable Care Act and its expanded coverage. This is seen as a great gift to Pelosi, who needed something coming from way to her right, and now can “pivot hard” to fight to preserve ACA from the GOP rather than fighting with her own party’s progressives. She also observes that the President has now moved from “who knew health care was so complicated?” to “I now understand health care especially very well”. Of course, he doesn’t – in fact, he understands it much less well than most policy makers, which isn’t very well at all, but he does understand how to both appeal to his base and please the wealthy folks who control the Republican Party, and indeed much of the Democratic Party. It is frequently pointed out that many of the people who were most helped by the ACA, in particular its provisions that allow individuals to buy insurance at community rating, prevent discrimination against those with pre-existing conditions, and expanded Medicaid, are those in Trump’s base, and that eliminating the program and leaving another 20 million people without insurance might backfire. Paul Krugman’s column “The Republicans really hate health care” is accurate, and makes this point; for example, that West Virginia was promised better health care and more coal jobs. It has gotten only a few coal jobs, but 140,000 people stand to lose health care coverage if ACA is repealed. It remains to be seen if this will translate into folks voting against him and his minions, but I wouldn’t hold my breath. Although, even the Wall St. Journal has had an op-ed by Robert Pollin advocating for Medicare for All. So what is it with the Democrats? The concerns that are expressed by many centrist, leadership Democrats about Medicare for All, or Universal Health Care of any kind seem to be in three broad areas: 1) Is it a good thing to cover everyone? 2) What will be the price Americans pay for universal health care? 3) Is this a politically feasible possibility? It is important to recognize that the fact that these questions are being asked at all, and that there is a significant portion of the Democratic congressional delegation who support Medicare for All, and that there is huge support among the American people, is YUGE. It is a testimony to how important health care is to us, to the fact that most of us are not buying the GOP line, and to the success that Sen. Sanders had and continues to have in raising the issue and continuing to focus on it. First, is it a good thing to cover everyone? Answer: Yes. Everyone needs access to health care, and those who need it the most are often those who are left out of current, past, and future schemes for coverage – mainly poor, or near poor, people. It might be ok to leave some people out if those advocating it, advocating incrementalism, would suggest that the appropriate people to be left of were themselves and people like themselves, or the wealthiest, who can afford to pay their own way. But no, it is always the most vulnerable. And, anyway, there is great advantage to everyone being in the same system; the wealthy and powerful will ensure that the system works for them, and if everyone is in it together, it is more likely to work for everyone. The Times has a recent article about Sen. Sanders saying “No to incrementalism”, which for some reason makes it sound like a bad thing. It is not. Certainly not if you and your family are being the ones left out by incrementalism! Second, what will be the price? It will cost a lot to cover everyone. The numbers that even the sponsors of HR 1384, the Improved and Expanded Medicare for All bill whose primary sponsor is Rep. Pramila Jayapal of Washington, have put forward are very large. The thing is, though, the numbers that we spend NOW, by insurers and the federal and local governments (via Medicare and Medicaid and covering all their employees), and out of our own pockets in premiums, deductibles, and co-pays are far larger! And, of course, all this money buys us neither adequate health care for lots of people who are underinsured or have insurers denying claims, or good health outcomes. The US has for decades trailed the developed world in almost all measures of population health outcomes, and led only (by far) on money spent, both in total and per capita. Much of this money can be characterized as “waste” in the sense that it does not deliver health care to anyone, but is spent on high administrative overheads and profits for insurers and providers and drug manufacturers. Third, is it politically feasible? This is an issue with lots of components. One highlighted by several articles in the media, such as the above-mentioned ‘Abolish private insurance: no precedent’ in the Times, are the jobs that will be lost in the insurance industry. And, although it doesn’t say it, in the offices of hospital providers who have armies of workers to fight with the insurance workers about payment. An expensive zero-sum game, except it is the people who pay. Sure, these are real job losses, but when has it been right to continue a bloated, non-productive industry that screws the whole country to protect jobs? I think never, but this is just a smokescreen for protecting profits. And HR 1384 actually contains funding for job retraining. The bigger issue for Democrats is money, money from big donors, as described in another NY Times article, ‘Even Liberal Democrats Can’t Quit Wealthy Donors and Their Big Checks’, although Sanders and Warren are the exceptions. In essence, “politically feasible” is always the one put forward by those who do not want big change to try to head it. But there is great momentum from, you know, regular people, now. We have to keep it up and demand it from our legislators and candidates, and that will make it feasible. The real threat, unsubtle and incredibly well-funded, is from the insurance and hospital corporations (and “non-profit” health systems) who are responsible for about 30% of all dollars spent on health care in the US being for administrative costs (including their huge profits) and not actually health care. They are a major cause of the high cost of health care in the US, and stand to lose the most if Medicare for All is implemented, because it will be funded in large part by taking that money away from them. Thus, they are highly motivated to attack any such attempt, organized to do so, and are already doing it, as clearly presented in Health Care and Insurance Industries Mobilize to Kill ‘Medicare for All’, NY Times February 23, 2019. This will ultimately be the real fight, incredibly wealthy companies that would lose a lot of money will do almost anything to keep it, even though it will prevent a change in the current crazy, costly, poor-result non-system that we currently have, that would benefit the health of all the rest of us. The more subtle attacks, or perhaps “criticisms”, are from other Democrats and ostensibly liberal media, like the Times. Senator Bernie Sanders (I-VT) sponsors a single-payer Medicare for All bill in the Senate, S-1804, and many of the current candidates for the Democratic presidential nomination are co-sponsors, including Sens. Elizabeth Warren (D-MA), Kamala Harris (D-CA), Cory Booker (D-NJ), and Kirsten Gillibrand (D-NY), and Rep. Tulsi Gabbard (D-HI) is a cosponsor of HR-1384. Sen. Amy Klobuchar (D-MN) and Rep. Julian Castro (D-TX) are not. S-1804 is not quite as good or comprehensive as HR-1384 (the even-better successor to the old HR-676), but this is not the reason almost all of them (except, of course, Sen. Sanders) have stepped back a little from, or danced around, their position on a single-payer program in various interviews with the press. They worry it might go too far, and while want support from single-payer fans, they fear alienating others, or believe that Medicare for All cannot happen, and talk about compromise. Several senators have introduced another bill that would allow people over 50 to buy into Medicare ('Medicare for More', but only if they pay). The Times, however, is getting more supportive; in their February 16, 2019 editorial ‘How Much Will Americans Sacrifice for Good Health Care?’, they move to focusing on the cost and practicality, and no longer say single payer or Medicare for All is not a good thing. “Compromise” is often touted as a good thing, and sometimes it is. Maybe it means you and your partner take turns deciding what movie to see or what to have for dinner. But often compromise is, as noted by business guru Stephen Covey, it is a “lose-lose”, where everyone gives up something they want. If we can find something that is “win-win”, it is of course better. Medicare for All might actually be a “win-lose”, a win for the American people (comprehensive health care for less money) but a loss of enormous profit for the big health and insurance corporations (no tears here). The most obvious flaw in the logic of the mainstream Democrats is harping on the cost. Yes, it will cost a lot, but the average American family will pay less than they are now in premiums, deductibles and co-payments. The big saving would be in the elimination of the money being made by insurance companies, drug companies, and health systems, and apparently Speaker Pelosi is not ready to cut off their access to the trough. Already, the government pays almost 60% of all health costs (Medicare, Medicaid, coverage for government employees, tax breaks for employer contributions to health insurance, etc.) This means that, in our country, the government already pays more per capita than in most countries that cover everyone. Yes, HR-1384 would expand the benefits of Medicare (‘Improved and Expanded Medicare for All’) to be basically everything with no copays or deductibles, and this would be costly, but those of us who can afford it pay for them anyway, and those who cannot currently do without. But there is another flaw. All of the folks advocating for less-than-universal-coverage, Medicare-for-More, buy-in to Medicaid for folks not poor enough to qualify now, let’s-not-let-the-perfect-be-the-enemy-of-the-good, are missing something. What they are missing is those people who are not covered or covered with poor insurance that won’t meet their needs if they are sick. All the compromise politicians and pundits seem to forget that these are real people, not just numbers (yes, if fully implemented the ACA covers 90%, but is that enough?). As I wrote in my very first blog post (“Universal Health Coverage”, November 28, 2008), ‘When was the last time, even in private but certainly in public, you ever heard someone say “I’m really suffering without health coverage, but don’t worry about including me and my family in your health reform plan. We don’t want to let the perfect be the enemy of the good.”?’ Those advocating for less than universal coverage need to get out there and tell us who it is that they don’t think needs good health coverage, who can be left out. You? Your Uncle George or Aunt Minnie? Your neighbor? Who are the Americans who they are advocating leaving out? I can tell you one thing. It won’t be them or their families. Medicare for All, or "Eat well, take your medications, and good luck!" I have often written about the need for a universal national health insurance plan in the US, even more frequently recently. This is in part because the rise in costs and cuts in health coverage for Americans, including especially those who are in states that did not expand Medicaid as part of the ACA, have continued to erode our health coverage and increase our cost. It is also in hope that the Democrats in Congress will not abandon a real “Medicare for All” program in favor of a non-solution such as “Medicare for More” or almost anything that maintains for-profit insurance companies. Many patients I see are very complex and, I think, not NP (Nurse Practitioner) appropriate but no one else is there for them because they are uninsured. And they tell stories of meeting with cardiologists who talk about several interventions and then when the MD finds out no insurance just says to them, “Well, be sure to eat well and take your medications and good luck”. And every day I see the effects of having so many people without insurance. I see the ones who ended up in the ED because of preventable problems. Yesterday I saw a 33 year old mother of two who had hypothyroidism, no insurance, ended up with severe cardiomyopathy [heart muscle disease] and heart failure all for lack of thyroid medication due to lack of care due to lack of insurance -- and she works in an MD office doing billing to keep our health care system going for those with insurance!!! This situation is neither rare nor new. It happens to that particular NP every day. NPs in many states work under “collaborative agreements” with sponsoring physicians, and in others have independent practice privileges. When the patients are too complex for them, “their” doctors may be unwilling to take them, if they are uninsured. In addition, in many cases, the NPs (or PAs) practice in remote sites – sometimes very remote. But, the reality is that even if the physician is willing to see them, even if the patient is seen initially by a physician and not an NP, ultimately there is a similar outcome for those people without insurance or with poor-quality insurance. This scenario happens all providers, physicians included, except those who refuse to care for poor, uninsured, and poorly insured people. It is essential that everyone who cares for, or about, people realize this, including the politicians who make the decisions and the pundits who opine about such things. They may be well insured, and likely most of the people that they know personally are (although every day that number grows smaller and the financial and health exposure of those who thought they were well insured grows larger), but many, many people are not. Whatever sticker shock insured middle class people have when they get sick or need medication (see the graph on the cost of Humalog ®, the most common insulin for people who need that drug to stay alive, vs inflation), it is much worse every step you go down the ladder of income into poverty, down the levels from “good” to “fair” to “poor” to “no” insurance. It is also critical to remember that any reform plan that does not cover 100% of everyone will leave people like the woman described above out, and the stories that physicians and other health providers have to tell about how their patients cannot get the care they need will keep coming. For a plan to not only be “good”, but to be affordable, every single person in the US needs to be IN. It is most affordable if it goes all the way, putting everyone in one plan (Improved and Expanded Medicare for All), because that would eliminate the massive profits of the insurance companies that have administrative overheads of over 30% (compared to Medicare’s 1-3%) and would tightly regulate the profits (and whatever your favorite expression is for money made over costs for “non-profits”) of providers. Other plans that are seen as compromises are, like so many “compromises”, lose-lose. By dealing in the insurance companies and their profits so they won’t oppose the change (as ACA did) we build in this cost to our system, siphoning off at least 1/3 of the dollars ostensibly spent on health care to overhead! One of the most widely supported bad ideas is continuing Medicare Advantage, also known as Medicare Part C. Basically, the insurance company that sponsors such a plan takes the money you’d get for regular Medicare (Parts A and B) and you kick in an additional payment, and you are covered, as in an HMO, for a variety of other services that traditional Medicare does not. It sounds like a good deal, and it generally is for the recipient with all the plusses (extra services at usually lower cost) and minuses (limited choice of providers, limit to geographic coverage area) of an HMO. At first, it seems to be a win-win, for patients and the insurance companies represented by America’s Health Insurance Plans (AHIP). AHIP has garnered letters of support just recently from 302 House members and 66 Senators, of both parties. The problem is that the insurers get extra money that traditional Medicare doesn’t, costing the public a lot (and sometimes involving fraud). Continuing Medicare Advantage not only gives some people better coverage, and makes a single Medicare for All again financially challenged, it costs the government more and makes insurers richer. A real Medicare for All – not a bunch of different plans, some of which cost more money and spend a lot of that on insurance company profit -- is not an unrealistic pipe dream. What is actually unrealistic is keeping the current system (or, better, non-system) we have, or some minor modification of it, and expecting that it will lead to better health for more people and lower cost. That won’t happen, and the idea meets Einstein’s definition of insanity: doing the same thing over and over and expecting different results. High costs – proportionately higher for low-income people – and poor health outcomes – also higher for low-income people – are baked into that system. Or, we can not do a comprehensive include-everyone program. We can stay with what we have, or some “part way compromise”. Read the story above again. Memorize it. Because, if we don’t have a universal health plan like every other developed country, it will continue to repeat thousands and thousands of times a day, in every city, state, and rural area in the USA. If not, be sure to eat well and take your medications and good luck! Venezuela and Medicare for All: Don't forget who benefits! The mainstream media is not an evil, liberal-to-radical behemoth by any means. It is, however, often a willing, and sometimes self-deluded, ally and shill for the interests of the well-to-do in society, as well as for many questionable government policies. The latter is particularly important in the drumbeat buildups to wars, and is recently apparent in the coverage of Venezuela in journals such as the NY Times. The US government is making the case not only that Venezuelan president Nicholas Maduro is illegitimate because it has decided his election was “unfair” and “tainted”, as well as an evil and violent dictator, but that it will recognize unelected self-declared Juan Guaido as president. The Times has gone so far as to publish a self-congratulatory op-ed by Guaido, and it news coverage is typified by ‘Venezuelans Opposed to Maduro Pour Into Streets for Day of Protests’ and a Sunday Review piece by a Guaido supporter called ‘Venezuela’s Very Normal Revolution’. I do not doubt that thousands marched against Maduro or that millions oppose him (or probably that millions support him). I certainly am not saying Maduro and his government is good, or that there is not justifiable opposition to his violent repression of opponents. I am not saying that revolutions are bad. I am saying that this one is funded and supported by the US government not because Maduro is bad -- the US has supported and continues to support dozens of brutal dictators around the world. It is because he is not our dictator, not one who supports US policy, and this is critical because Venezuela is the country with the largest oil reserves in the world. As for the NY Times -- as with most leftist governments, the support for the one in Venezuela comes more from the poorest people, while those with access to the NY Times are among the most privileged. And this is the connection to domestic health policy, and in particular coverage of the Democratic candidates for president’s positions on Medicare for All. The NY Times (and all mainstream media) is of course owned by the very wealthy, and as individuals they see the world as members of the class of which they are part. But, possibly more important, the editors and reporters are middle and often upper-middle class, and they see the world from this perspective, from that of their families, and friends, and neighbors who are – amazingly – also privileged! The people who have access to these editors and reporters are very skewed away from the most needy, or indeed most people (who are not the same as most people in an upper middle class suburb). In specific, we get essentially uncritical coverage of the statements of billionaires like Michael Bloomberg and Howard Schultz that “Medicare for All” is unaffordable, despite the clear fact that it is the current system that is unaffordable, and that a universal health system is going to cost less. One key part of this lower cost is the elimination of private health insurance companies’ profit, and their incentive to increase it by decreasing the availability of care. Yet the Times article covering Elizabeth Warren’s increasing iffiness on the issue contains phrases like ‘would people lose the choices offered by private insurance?’ That is, your ability to choose (maybe, depending upon what their employer offers) which overpriced-to-unaffordable policy, offered by which rapacious, obscenely-profit-making insurance company, to cover you so that, even after paying the premiums and co-pays and deductibles, you find out that, whoops, it doesn’t really cover what you thought it would or should, and you’re out of luck, and either have to pay out even more money you cannot afford or go without the health care you need. Wasn’t that what the insurance you bought supposed to get you? Nope, not necessarily, and often not at all. 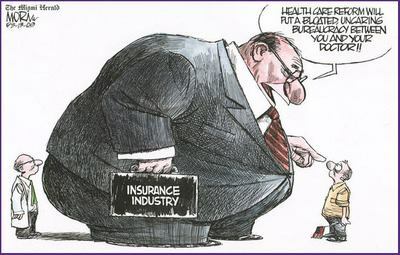 The first goal of private insurance companies is to make a profit. That profit has to be maintained and expanded. The two major ways of doing so are 1) by raising the prices people (and their employers, if they are lucky enough to have employers who pay offer health insurance) pay, in premiums, deductibles, and co-pays, and 2) by denying coverage for care, or paying less for it, which often results in providers not, well, providing it to you. The insurers hire “pharmacy benefit managers” to get them the ‘best’ prices on drugs, often requiring your doctor to keep writing a different brand-name drug-of-the-month (again, see Danielle Ofri, “The Insulin Wars”), with the cost to you always going up. What would Medicare for All offer? Or, more explicitly, Improved and Expanded Medicare for All, as in the House Bill that was H676 and will get a new number this year? First, everyone would be in the same program. No more shopping around for the least bad deal among the universe of bad insurance. Everyone would get the same benefits. The benefits would include all medically necessary health care: inpatient, outpatient, nursing home, home care, drugs, mental health, dental, eye care. Even hearing aids. Nothing excluded, except perhaps truly cosmetic surgery. Providers could not refuse to accept this insurance because they would have no business. Oh, maybe some doctors and hospitals could make a living caring for Howard Schultz and Michael Bloomberg and Saudi sheikhs who pay in cash, but there aren't very many of them, and so even the supplemental insurance we now buy would be unnecessary. There would be, you see, no deductibles or co-pays. Everything would be 100% covered. It sounds good. It would be good. And it is not unaffordable. Currently, the government funds over half of health care (Medicare, Medicaid, government employees and retirees at all levels, military), and it is about 60% if you also count the revenue lost because employer contributions to health care premiums (unlike salary) are tax-deductible. The majority of the sickest and most needy (elderly, blind, and disabled) are already in Medicare. Most vulnerable children are in Medicaid or S-CHIP. To make up the additional cost, employers and individuals would continue to pay, but in taxes rather than premiums, co-pays, and deductibles, and for most (maybe not for Schultz and Bloomberg!) it would cost them a lot less. Most estimates of the excess costs in the US health care non-system are in the 30-35% range, for profits and administrative costs in the private sector (Medicare’s are in the 1-3% range). Administrative costs include insurance companies hiring armies of workers to deny claims, while providers have other armies to fight them, and demand more. This is money spent for no health benefit for the population, but it would be a mistake to minimize the extent to which those – insurers and providers and drug and device manufacturers – who are pocketing it would go to keep it coming. Thus the role of the mainstream media, and the mainstream Democrats – to appeal to the needs (not desires, real needs!) of most of the people for health care and at the same time not threaten the wealthy and profitable sectors that can fund campaigns for or against them. Thus the concerns of “don’t people want to have their private insurance?” and even more ludicrous their choice of insurance company (“I’ve always been an Aetna man! So what if it costs a little more and I get just as little? I’m worth it!”). Thus the nonsensical pieces on how much a single payer Medicare for All program will cost, which ignore the cost of our current arrangement. And, somehow, manage to not address the fact that this current arrangement leaves concern for people’s health to last, and so doesn’t deliver it. I understand that people are worried about change. But the cost, in dollars and health, of the current system has moved the majority of the population to want something different, something that meets their needs and costs less. It is available, if we seek to do it, if we can resist the pressures from the industries and billionaires who profit from the current way of doing things. When we read about the need to overthrow foreign dictators, or hang on to private insurance companies, we always must remember to ask: cui bono? Hospitals post their charges: almost indecipherable, but important! The Arizona Star piece on Tucson hospitals had a more moderate title, “Hospitals post prices, but public can find it confusing”, but made the same points. As a physician (if not a brain surgeon!) I think I can figure out what most of these mean, but the point that they are making is that they are hard for almost everyone to understand. The reason, of course, is that they have simply posted online their “chargemasters”, the price list that they supply to insurers (including Medicare and Medicaid), which are based on the nationally used “procedure codes”; these are numbers which identify different treatments that are abbreviated as above. So, the charge at Baptist for a radiologist injecting dye into an artery supplying your intestines is only a little over $5,000, while Vanderbilt charges over $42,000 to do a surgical procedure to close a shunt artery in your heart that is vital to fetal circulation but normally closes spontaneously after birth. The question is, what does all this mean? And what are you and I supposed to do with this information? Elisabeth Rosenthal, the emergency room physician turned NY Times reporter turned editor of Kaiser Health News, is more optimistic in her Times Op-Ed on January 22, 2019, “Donald Trump did something right”. She acknowledges the opacity of the posted charges to most people, but says it is a great step forward, because they are accessible, at least to those who are academic experts, and can be compared, both one hospital to another (“Maybe, just maybe, a hospital will think twice before charging a $6,000 “operating room fee” for a routine colonoscopy if its competitor down the street is listing its price at $1,000”), and to alternative treatments (“With access to list prices on your phone, you could reject the $300 sling in the emergency room and instead order one for one-tenth of the price on Amazon.”) Obviously, these would not be easily available on your phone now, but her hope and expectation is that third parties will develop apps that will take this nearly impenetrable information and make it easily accessible to people, as apps such as GoodRx® have done for drug prices. She emphasizes the magnitude of this change, since before now these prices have been closely-guarded secrets. Rosenthal makes a number of other important points that illustrate the fact that this system is not only opaque, but deeply morally corrupt. Hospitals are run as businesses, to make money, even when they are ostensibly “non-profit”. Their CEOs and other executives are mostly businessmen, CPAs and MBAs – even when they are physicians, which sometimes happens, they are usually also MBAs – and are hired for their ability to run a money-making operation that happens to sell health care. And sell it, to your insurance company, at what often seems like deeply discounted prices because they are based on absurdly inflated chargemasters. “You don’t really want to change your charges if you have a Saudi sheikh come in with a suitcase full of cash who’s going to pay full charges,” says one CEO. More important, it allows them to reach agreements with insurers to pay a lot less than the official “price”, which in turn allows those insurance companies to brag to you about how much money they saved you. Rosenthal notes this is farcical, raising prices to make you think that you got a discount (‘If a supposedly $1,000 TV is “on sale” for $80, it’s not really a discount. It’s an absurd list price’), and that it emulates practices in other arenas, such as airlines overestimating their flight times to make it seem like they have a better on-time percent. When Wanda Wickizer had a brain hemorrhage in 2013, a Virginia hospital billed her $286,000 after a 20 percent “uninsured” discount on a hospital bill of $357,000 — the list price, according to chargemaster charges. Medicare would have paid less than $100,000 for her treatment. Wait. Medicare? Medicare would have paid a quarter of their list price and a third of what this uninsured person got billed with the “discount”? Yes. And that is a place to start. Hospitals – or the third-party app developers that will let you see these prices on your phone – should be required to list the Medicare-approved payment right next to what they will charge you, or your insurer. That would measurably increase the “light of day”. Of course, some doctors and hospitals do not want to accept Medicare for this reason – they can charge more money to insurance companies, who pass it on to you in premiums (in addition to your co-pays and deductibles) while claiming to be saving you money. There is a solution to this also, although Rosenthal does not mention it. It is to have everyone in the same insurance program, a single payer, an improved and expanded Medicare for All. This would set the rates and pay them, without co-pays or deductibles for necessary services. Everyone in the same plan would mean that the better educated, wealthier, and generally more empowered would ensure that it worked for them – and thus would work for everyone else, middle-class, poor, and even homeless. Yes, hospitals and other service providers (physicians, nursing homes, etc.) and drug companies and insurance companies would make less profit. I’m sure that your heart goes out to them (maybe the next requirement could be the posting of the salaries of the C-suite executives at hospitals…). But, after all, what the health care system should be run for, and is run for in every other developed country, is the health of the people, not the profit of corporations. Amazing, huh? And it could be that way here! There has been a lot written about capitalism. Karl Marx, for example, wrote a multi-volume study of it just about 150 years ago, and since then a lot of the writing has been about what he wrote, supportive and critical. There is no question that it has remained the dominant economic system in the world; it is the linchpin not only of Western “democracies” and totalitarian fascist states but also ostensibly Marxist governments like China. While capitalism has both its defenders and detractors, it is interesting to me that the defenders spend little time defending the amazingly deleterious effects that it has on the quality of life (and even existence of life!) of people, the environment, war, and (to the point of this blog) health. The problem is that, in pursuit of profit, industries will do and have done almost anything, with no moral compass or conscience, and, worse, with no concern for future generations or the planet. Some of the most obvious and egregious examples in the US at this time include their (largely successful) lobbying of the current administration to roll back on rules to ensure clean air and water and the overall environment so that they (in this case, extraction industries like oil and mining) can further increase their unconscionable profits without worrying about the damage it does. So we have mining and extraction in and near our national parks (“near” is important; air and water do not respect boundaries! ), scaling back of national monuments so extraction can take place, poisoning of the water through leaks in oil pipelines (such as Keystone), and poisoning of the air we breathe when fossil fuels are burned. Oh yeah, and the increase in global warming which has already permanently altered the climate and will eventually wipe out life on earth (starting with the lowest lying areas) if nuclear war doesn’t first. Our health and safety is also constantly at risk from aggressive efforts by corporations to increase their profits. This can take the form of producing unsafe products either because it saves money (e.g., dangerous child toys) or costs a lot to not do (e.g., not having lead in our water or asbestos in talcum powder), or by making important and beneficial (and hopefully safe) medications unavailable to many people because of incredible price increases (for the tip of the iceberg, see “Epi-Pen® and Predatory Pricing: You thought our health system was designed for people’s health?, September 3, 2016). We of course know about the ongoing – and largely successful efforts – of the tobacco industry to increase their profits by promoting a product that kills 400,000 people a year in just the US (mainly from cancer and heart disease), including through promoting it to children (e.g., the cartoon character “Joe Camel” – see Fischer et al, “Brand Logo Recognition by Children Aged 3 to 6 Years: Mickey Mouse and Old Joe the Camel”, JAMA 1991;266(22):3145-3148, December 11, 1991). One of the most vicious and insidious efforts to compromise our health in the interest of profit has been carried on for more than a half-century by the sugar industry. For decades, under the table, sugar producers funded scientific research into the negative effects of a high-fat diet while ignoring the almost-certainly more detrimental effects of a high-carbohydrate, especially simple carbohydrate – sugar – based diet. Soda pop became the national beverage with incredible impact on the rate of obesity, in the US and internationally. A 12-oz can of Coca-Cola® has 140 calories, so what about that 40oz fountain drink at the convenience store? A 2-liter bottle has 812 calories. That’s a lot. So most health professionals, like doctors, tell people to not drink it, or not very much of it. This is, however, competing against the messaging of the industry, which pushes it a lot, and gets the cooperation of many nutritionists through the use of – wait for it – money! I have written about the corruption (or conflict of interest, to put it nicely) of health organizations like the American Academy of Dietetics and Nutrition (AADN) and the American Academy of Family Physicians being funded by Coca-Cola® and other sugar purveyors and having their ads on their websites (The AAFP, Coca-Cola, and Ethics: Serving the public interest?, August 20, 2010). The ads are no longer there, but you can read about the AADN at the fooducate blog, and if you search sugar on the current AADN website, you will find some pieces on limiting sugar, but as many on the potential risks of artificial sweeteners (which, whatever your beliefs, the FDA rules as safe) and fats. …a worldwide organization with a Washington headquarters, funded by many of the biggest names in snack foods, including Nestlé, McDonald’s, Pepsi Co. and Yum! Brands as well as Coca-Cola. It has 17 branches, most of them in emerging economies like Mexico, India, South Africa and Brazil, and promotes itself as a bridge between scientists, government officials and multinational food companies. But in China ILSI is so well-placed that it runs its operations from inside the government’s Centre for Disease Control and Prevention in Beijing. In fact, when asked to comment on the studies, the ministry emailed a statement not from a government official but from ILSI’s China director. Thus China’s health policy, which almost entirely focuses on exercise like “Happy 10 minutes” (good for you!) and ignores the dangers of high-calorie sugar-laden foods for obesity (and there is excellent evidence that diet is probably about 80% of the issue, with exercise critical for the other 20%). There are those who will argue that it is not capitalism itself, but “unfettered capitalism” that is the problem. There is a lot of truth to that. The blind pursuit of maximal profit with no attention at all to the negative impacts on the world around them is not a necessary part of any profit making endeavor. Indeed, the “Wealth of Nations” by Adam Smith cautions strongly against this sort of excess, and “the only responsibility of business is to make profit for its stockholders” guru Milton Friedman sort of assumed that they wouldn’t do it. But they do, and “unfettered” – or corporate gangster capitalism – is what is running the world. And it is not good for our health. What is wrong with the Match? White supremacist attacks and mass murders: It's not anti-religious, it's anti-people. The flu is a virus! The AAFP, Coca-Cola, and Ethics: Serving the public interest?